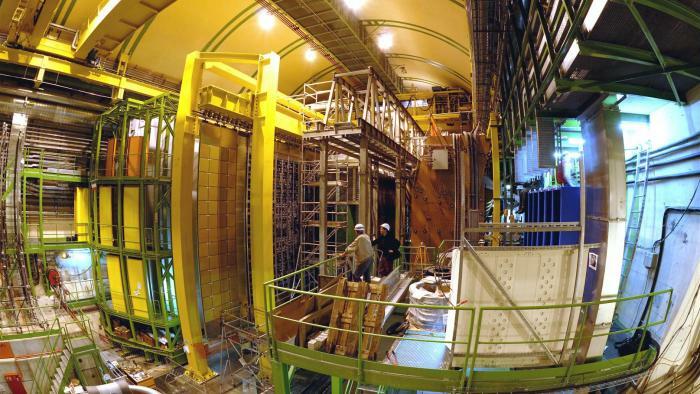 The LHCb experiment at CERN reports precise new measurements—but leaves open the question of why our matter-dominated universe exists. “Today, scientists from CERN’s LHCb experiment announced new results in the study of the evolution of our matter-dominated universe. The face-off between matter and antimatter was supposed to be a fair fight. The big bang should have created equal quantities of matter and antimatter, which are identical to one another but with some opposite properties such as charge. As matter and antimatter interacted over the past 13 billion or so years, they should have annihilated each other, stripping our young universe of its potential and leaving it a void. But scientists think something happened in those first moments to upset the balance, skewing the advantage slightly toward matter. Over the past several decades, scientists have found that some particles decay into matter slightly more often than they decay into antimatter. The Standard Model of particle physics predicts a certain amount of this imbalance, called charge parity [CP] violation. 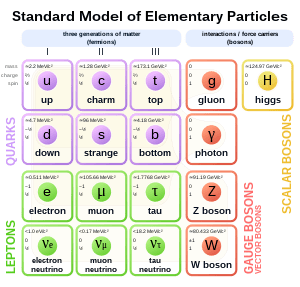 The Standard Model of elementary particles, with the three generations of matter, gauge bosons in the fourth column and the Higgs boson in the fifth. However, the points this wins for matter can’t account for the amount of it left over in our universe. In fact, calculations suggest that it’s not enough for even a single galaxy. Since there may be as many as 500 billion galaxies in our universe, something is missing. Physicists are looking beyond the Standard Model for another source of CP violation that gave rise to galaxies, stars, planets and, eventually, us. In 2011, LHCb analysis hinted that the CP violation in D mesons went beyond the amount predicted in the Standard Model, a possible sign of new physics in the works. But in results presented today at the Rencontres de Moriond physics conference in Italy, those hints of new physics have melted away, reinforcing the predictions in the Standard Model of particle physics and leaving us with the mystery of why our universe is made of so much matter.